Stars, Mud, and Love–A Model of Everything: 8. More on Body and Soul | The Meaning o' Life! Okay, so you kinda lost me here. I was with you up until the “pain” example. I don’t understand how this helps your model. It’s an excellent example of how we don’t understand (yet) the realtionship between physical and sensory (sp?). You say the chemicals don’t feel pain. Chemicals are the physical basis of what can create a feeling or sense in our brain but since chemicals don’t “feel”, then feelings are not real? Is that what you are getting at? So we can see the place in the brain that can sense a smell and we can see that there is a tool to detect that smell (our nose) but we can’t see the place in physical reality that makes that smell translate into a memory of lost love or attract us to look for honeysuckle. Is that where we are going? Well the term “real” becomes quite tricky when you begin to talk about complex systems and “sensing”. Let’s use a different example from pain, let’s use sight. Now the component parts of an organism — whether we are talking about chemicals or atoms or sub-atomic particles — none of them on-their-own can see. The ability to see, the sensation of seeing, the emergence of a property called sight is the result of complex systems (within systems). The point of this post is that the emergence of sight is the product of this complexity, not from some a soul that is doing the seeing through the chemicals (or atoms, or whatever). 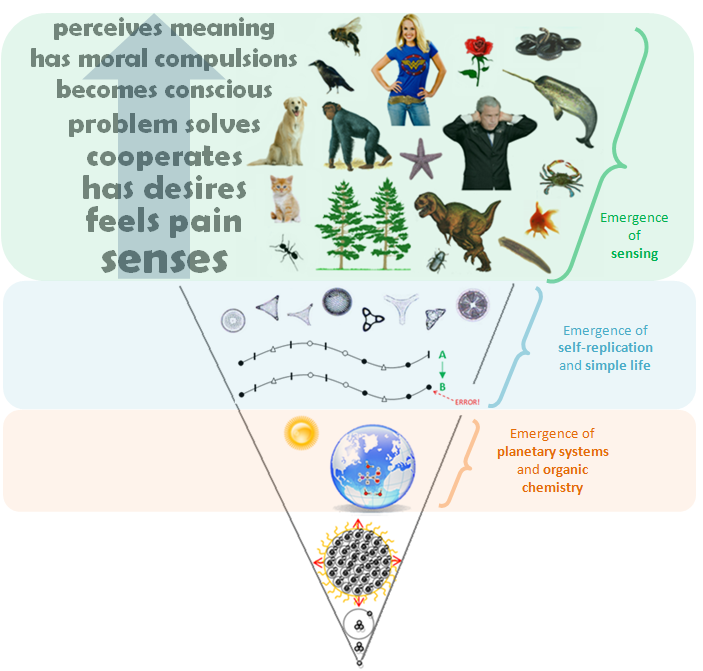 So if fish don’t need a soul to see, then we don’t need a soul to think or to love or to work cooperatively within a community… those are still higher functioning results of sensing, of which sight (or pain) is just an example. Most proponents of souls will grant them to higher function beings such as humans (and because the idea that love is just a chemical reaction seems to denigrate love, rather than lift chemical reactions). Well, i say, if we need a soul to love, then fish need a soul to see, rats need a soul to feel pain, and slugs need a soul to touch. Now I’m not saying we know exactly how senses arise, but we can deconstruct and manipulate them by changing only chemicals (we’ve also got a good line on how memories are formed and the specific areas of the brain that light-up when we remember our lost love at the waft of honeysuckle), we need not tinker with the soul to remove or enhance pain. So though just how the feeling of pain or sight or touch emerges may not be fully understood, i say it is material and it is real (though others have said it is not real). It is real because i’m sensing it, other’s sense it (in themselves), and there are known mechanisms at work… but alas this is going to head us down the same hole as the last post! So, yeah, there are open questions… and i don’t have all the answers, but i do have more to say… in the next post! Right, i understand you there. The points you bring up are definately debatable as you know….and i keep my promise to hold off until your model is done. I’m just making sure i understand everything, so let me clarify some more. I was under the impression that pain’s existance was to tell the brain to cease and desist what the body is doing as a means of a defense mechanism. Are you saying that this is not true, just another illusion that we assign is to appear that is has “meaning”, when your point of your model is there is no intent behind pain…it’s completely mindless? Am i getting that right? I didn’t pick that up in the initial reading of your post until your last response. There are some subtleties here. When you say “pain’s existence is to tell the brain to cease and desist what the body is doing as a means of a defense mechanism” — if you mean pain is “designed” for this “purpose”, then i would say no, it’s not. But if you mean to say pain fulfills this function, then I’d say — yes, yes, spot on. Bodies that experience pain avoid activities that cause pain, because pain hurts, but there is no intention behind “giving” organisms the ability to feel pain. I should also say i’m sure pain as we know it did not evolve in a single mutation. I don’t know if touch came first or pain, or maybe some kind of touchless pain — in any case, it likely started quite small and as other mutations occurred, it became more complex… and you can be sure there have been individual organisms that experienced more pain than what we feel but it provided no advantage or it was a hindrance and its genes never made it to future generations (because that much pain is really no help at all). I don’t understand what you mean by saying pain really does hurt. I understand you are using pain as an example of emergence, where connections link to make a complex sense but i don’t understand that sentence. Of course pain really hurts, that’s what it is, right? I’m not trying to be nitpicky, i’m just making sure i’m not missing a point you’re trying to make. okay, cool….looking forward to the next installment!